Work for Cisco Webex Meetings? Learning about Cisco Webex Meetings? "Pretty on the surface, but ugly underneath meeting software"
Webex has a nice integration with microsoft outlook that allows users to seamlessly send calendar invites with links to meeting rooms. It is also possible to call into meeting from multiple devices, which is convenient for doing business on the go. Webex is always unreliable. Our teams spend at least 10% of every meeting (no exaggeration) figuring out how to coordinate webex, and it is always a painpoint. The conference hardware is archaic and non-intuitive. Once you are actually in a meeting, it's unlikely that everyone will be able to hear or see each other. Moreover, the control buttons have few descriptions and are thus confusing to any user. Webex should solve problems around meeting coordination, call management, and the maintenance of regular communication with remote works. I can't say it has delivered on any of these things. "Suprisingly poor for a Cisco Product"
Once you've loaded all of the participants then re-inviting them to invents was fairly easy. When I compare it with our recent technology acquisition (Zoom) then I realise that despite the reasons we changed, this product is lacking in many areas. With WebEx setting up meetings required me to input all of the attendees details first. I then had to create my own calendar entries as it doesn't work seamlessly with Outlook. The audio was a constant problem and we frequently had to use conference calls in conjunction with the video on WebEx. The last straw was a general failure of the European infrastructure, which meant rescheduling all meetings for that day. The product is also far more expensive than the competition, which is a big deal for small businesses. I suppose it's probably wrong of me to say but I'd recommend looking at Zoom before going with WebEx. They offer a better product at a much better price. We used WebEx for online training sessions and still continue to use it in particular circumstances. I suppose that WebEx helped me get started with training remotely. "The worst virtual meeting software I've ever used"
I've used a handful of virtual meeting software programs over my career: WebEx, GoToMeeting, Zoom, join.me, Skype, Google Hangouts. I can only think of two ways that WebEx shines over other virtual meeting software products I've used. 1. I've never reached a participant limit. Some of the free/less expensive programs have limits. 2. They seem to have a better connection than most (not all). I've experienced less lag or dropped calls than I have with join.me or even Hangouts. - Their screen sharing options don't work. The only one I've been able to get to work is my main monitor, which is problematic because that's where all my chat and email notifications come in. So if I don't remember to close email or chat before sharing my monitor, the other participants may see things they shouldn't. - All controls completely disappear when you share your screen. And the process for getting them back is horrendous. GoToMeeting has solved this issue far better than anyone else, by allowing to you move and control them however you choose. - Their plug-in with Microsoft Office on a Mac is full of bugs. I've spent hours resolving issues where the WebEx plug prevents me from creating, editing, or deleting calendar invites. I've learned from experience to force close the plugin whenever it's preventing me from doing what I need to do. If you need the screen sharing or collaboration tools, save yourself the hassle and use GoToMeeting instead. Its a far better product. Internal and external virtual meetings. "Does do the job, but some limitations and not very user friendly"
Ability to collaborate with video calls and screen share. The user experience is bad, long loading time. You can do what you need, but it is always some clicks and configuration work need. In particular opening a meeting needs to setup audio and video devices every time, click ok, to make the setting work and so on. Viewing multiple participants with video and sharing screen at the same time is not good from layout of the video windows. Much space on the window is wasted to unnecessary ui elements, empty space. Multiple monitor support on macOS is really bad. That does not work at all. If you need this, don't use WebEx. If you don't mind about user experience and you love configuration dialogs, having to setup multiple things right before the meeting, then WebEx is an option for you. The features are working, but with some manual work and configuration. Screensharing and video calls to collaborate with team members around the world. "Because Lync/Skype wasn't available at the time"
The fact that it's such a process, even in an previously setup meeting to get everyone connected and particularly dialed in. In this day and age, I shouldn't have to dial-in each time. It should ring my phone. Don't even get me started on adding a meeting to an email. They insert placeholder text and only when you're sending does that get converted into a link. I get that you don't want to create a meeting link unless the email/meeting gets sent or is created but it's definitely confusing to users. Especially when they're unsure if they set the meeting up correctly particularly making sure that there is a conference number attached for those that don't voip in. Copy Skype. Try to create better integrations with the system software. This allows us to communicate with workers in satellite locations. There's not much of a benefit other than the stated purpose of communicating with those who can't be in the same room as you. As a new user I was invited to join a really important meeting, an interview with one of the most renowed companies in design, to bad that it really dosent work if u are using safari, so it's not true that it works on all brownser. It was really an embarassing thing. it really dosent work if u are using safari, so it's not true that it works on all brownser. It was really an embarassing experience. the issue was that every time i join the meeting it keep asking me to install the damn add one and refresh the page, restart the page just doesn't work..
As a new user I couldnt imagine that it really dosent work if u are using safari, so it's not true that it works on all brownser. they should advise to use other browser instead. a kind lady from India from the custom service help me fixing the issues. but i still think they should advise expecially new user, of the problem of integration with safari. that is really not professional and is a sign they don't care for all tehir user. i see the potential but for me was an awul experience, as a new user they should send advise me that it dosen't work on safari and please install haed onother browser. Does admitting difficulties really matter? you cisco guys didn't get this issue right! "Unprofessional company - doesn't care about cusomers"
After our latest experience with them, not a whole lot. They are expensive - not just a little, but almost TEN TIMES the nearest competitor. And by the way, that competitor has better features than Webex. The thing that we disliked the most though was how they treated us - and continue to treat us - when we tried cancelling our services. We have been with them for close to SIX years and paid them a LOT of money for their services. And yet, when we tried to cancel our service, they want to charge us for the remainder of the year because - they say - our annual contract was recently renewed. This is beyond appalling. Again, this is not a case where we have tried to wriggle out of a contract after a few months. We have been paying them for close to SIX YEARS. At this point, one would assume, they would treat us with some modicum of decency, but that is probably way too much to ask. STAY AWAY and get all the features they offer with a tool that is one-tenth the price. We are/were using Webex Training. "So Many Ways to Break"
I enjoy the time that I'm not using WebEx. So much lost time dealing with WebEx issues of many kinds. I've been in meetings where everyone is logged out, nobody's in the meeting, and WebEx is still going. Either a miracle or some possession going on there. When it works, it handles large groups well. Basically everything. The files that I load always stop working for no reason, the annotations aren't smooth or fast, there is no way to embed a survey other than their polling software which is not robust at all,... I could go on. We use it for our webinars. I mostly use it for informal meetings. "Powerful, but expensive an hard to use." WebEx, when you figure out all of the features, can do quite a lot. It's just too tough to use. Consistently, I've struggled both in meeting setup, and especially as someone leading a meeting to use the features and manage the software. That's even more challenging when you're also trying to lead a meeting at the same time. There are significantly better, more cost effective solutions out there--Zoom in particular. Unless there's some really specific feature that WebEx offers that these other platforms don't, I think that there are better solutions than WebEx. We have a diverse group of people spread around the country. When we used WebEx, we had tools to be able to schedule and bring meetings together, and using phones for call-in was a real bandwidth saver. "Not my type of software"
I didn't really like anything about WebEx, to be honest. It was clunky and difficult and always having issues. The user experience wasn't very good and the quality wasn't either. It was used widely throughout my company so I didn't have another option but I really just didn't like it. There is better and less expensive software available. I didn't find the quality to be up to par and it's best described as "clunky" in my eyes. My previous company used it to set up meetings between several offices across the globe. It was a way for us all to conference in and screen share. "Avoid this platform at all costs! " If you enjoy out-dated platforms that can't be customized and look like they came out of the 1980s, this is the platform for you! Webex has done nothing but create problems for our company. We recently ran a webinar with the "record" button disappeared. Tech support was not able to give us an answer on why this was the case and the only help they offered was to kick all 100 event participants out of the meeting to start over. We've also run into problems where we send out a registration link and then the link went dead. Webex said that they did software updates and that all links changed... so we had to send another e-blast out to our mailing list with updated information. I'll add also that users must manually connect their audio when they sign in. This means that if you use this software, you will need to explain over and over and over and over again to participants how to connect their audio. People get frustrated and end up leaving the meeting without connecting, as there are several steps that they must take to connect. Both of these situations, as well as others that have arisen, have put us in a place where we waste time and look unprofessional. Webex has not solved any problems for us. Webex creates problems. "It works, but it's not without issues"
I like the ability to present desktop to anyone with the appropriate link. I dislike that the VoIP doesn't work better. More often than not, WebEx sessions that I am a part of use teleconference for the audio. It's annoying to have to be on the phone and on my computer at the same time. I'd encourage others to compare WebEx against Skype for Business. My organization has both, and I prefer Skype for Business. It facilitates real-time distance collaboration and online meetings. It's much easier to present one person's screen than have each person flip through a file on each of their own desktops at the same time. "There are Other EASIER Options"
There isn't much that I enjoy about Webex. There was a short time that I utilized this program, and I quickly found that there are other options out there that work more efficiently. I dislike the fact that logging in when someone sends you an invite is a pain. It's difficult to schedule your meetings through Outlook. I always have issues when trying to invite other to join a meeting. There's just glitches in the software that it seems no one took the time to fix. I'm not solving any business problems with WebEx. I now use Uber Conference and I like it so much better! The only thing I will say that I prefer in WebEx is that you can record the actual video footage of the conference and not just the voices on the call..
"Not a great Webinar Solution"
Out of the box integration with Eloqua. It's not a great webinar experience. It only supports 4x3 ppts and their recordings only are available in their proprietary format for Event Center - which means you need to spend the time converting it, and hope it works. Their audio is confusing. once you start sharing a presentation, any one that joins late has to figure out how to find the audio instructions, and audio broadcast is hit or miss with whether it works for my attendees. If you are hosting webinars, there are lots of other vendors out there - the issue is finding one that has a native integration to your MAP that will be maintained for you. They all have their tradeoffs based on my experience, but Webex is definitely not trying to win the Webinar market, and so if that's what you're trying to do there are better options out there. 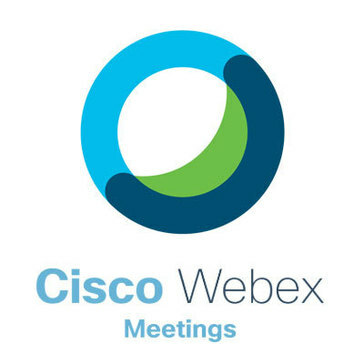 "Webex is an adequate meetings service for internal communication"
Webex provides adequate communication services for internal meetings, connecting offices separated by continents. Webex is not very intuitive, the UI is not good, and has a good amount of errors/issues. It is being replaced by RingCentral within our company. Compare to other meeting services such as Ring Central, On24, Zoom, Teams, etc. Internal meetings at various levels and office locations within the organization. "WebEx - Not good for conference calls "
Conference calls with both internal and external participants. "Not the Best Conference Service for Business "
I like that you can start an instant meeting with one click of a button. I like that there is the option for voice only conference and the option for an international conference number. The software must be downloaded prior to using it, it does not work well over the mobile app, the voice quality tends to be very poor when using a mic through the computer, I would not recommend using the dial through the computer feature as it rarely works. I am a recruiter that hosts interviews for our various office locations across the world. We also do online assessments that are proctored through WebEx. Having to install 3 different plugins just to get it to work for 1 meeting. This is sarcasm, I did not enjoy the interface whatsoever. Everything. Having to install 3 different plugins. The permissions this thing wanted was ridiculous. If I had a choice I would not put it on my computer. I promptly uninstalled it at the first opportunity. Kill this product in its current form and come back for the Zooms and Go To Meetings of the world. "If you like waiting for loading screens and hearing a ton of beeps, this one is for you!" Every time someone joins or leaves, there is a beep, no anonymity for large group conferencing. The many issues that we have had with them and the severe lack of customer support. If you like horrible customer support and lots of technical issues then webex is for you! They cancelled our account without any warning even though it wasn't due for payment and we had a webinar scheduled. We have a recurring ongoing issue with participants being added as presenters without our knowledge. When we tired to take care of the problem they say there is none. "Not the best webinar platform"
I don't like the webex functionality. I can't think of anything good to say about it. We initially used WebEx for all of our webinars but due to the unreliability of the platform we moved to another provider for these. "The premium service is overkill and hard to cancel"
Premium service is good for meetings with more than three parties. We never do, so as it turns out the free service is fine for us. We purchased the premium service but found we did not need it, the free service is completely sufficient. Canceling on-line (by phone is not permitted) is virtually impossible. The website freezes once you select cancel. Our account was then billed for the following month even thought the service is not available. Don't commit to premium service unless the free version does not meet your needs. The automatic billing is very difficult to cancel. Marginal benefits. Again, the free service is fine. I like Webex for "sunny day" scenarios where the meeting organized attends on tinge, the meeting doesn't game to be rescheduled and everything works! When anything needs to be adjusted with the meeting, it needs to be done via the webex server...so it cannot be done after the meeting starts. Many times, there are technical glitches on top of these restrictions. Remote meetings with team members that are not colocated with me. Nice features like Webcam, Internet audio, screen sharing, and assigning presenters. Needs flash, and not friendly with Linux or chromeOS. Good fit for heavily-invested companies with Cisco. Doesn't work well with Linux, but it can work if you get all the tricky prerequisites. No luck at all with ChromeOS. Problems - groups presenting or collaboration. Benefits- industry recognition and easy to use. I like that I can log onto a training from all over the world. I dislike the log in process & finding the appropriate room. It is beneficial to be able to attend trainings or meetings when participants are all over the country or even the world. Webex had a high sound quality and easy to use once you were signed in. The interface is in almost real time when time sharing. the interface between Webex and Dropbox was confusing. Having to reserve a line that my team shared could also be tricky. Clients also struggling signing in. It's great once you get it set up and you learn how to use it but the interface isn't ideal. Needing to host internal and external meetings. "Not intuitive or user friendly"
The interface is nice. It is also reliable. I have used other services that drop calls. I haven't experienced that with this software. It's too complicated to set up. There are too many steps, especially if advising someone from outside your company to join your video conference. I think its OK for internal use, but not really for recruiting. It's nice to use for company meetings, but I don't like using it for guests (ex. candidates). Video and Audio Clarity is always consistently good. User interface isn't great. Difficult for my customers to register and login. try other options. users hate joining webex meetings. Virtual meetings to avoid driving to clients etc. This software takes a long time to install and load. It is not something that an external person can easily login to. This helps make remote working and collaboration easier. I do not see many benefits to this software. "Way more complex than it has to be"
Evereything was a pain to set up, from downloading the client to setting up and joining meetings. "Call in number either in Europe or NA, not both"
communications. Not solving with Webex. "Terrible. It continually crashes my whole system. Plenty of similar apps that run smoothly." I did not like this product. I do not have time to work around it's problems to make my PC compatible. Everything. It's slow. It crashed my whole system. I have no desire to "fix" my system when there are others that work without needing call IT. I use web conferencing for presentations and seminars. This product did not help me. I like trying new products, but this one lost my interest quickly. "Customer service and communications are horrible"
At this point, nothing. You can get the same functionality from other companies that actually care about what their customers thing and know how to communicate if say for example you thought the account was canceled but they still had the clock running. Horrible communications. Not even a hint wanting to satisfy or keep a customer. Be prepared to actually call them to cancel your account and GET CONFIRMATION that it's canceled. GO ELSEWHERE. These guys make it hard so hard to cancel and don't care if you're not happy. The competitors offer the same features for less money and they actually care about their customers. Telecommunications. Went with a competitor and saved money, better customer service, better communications. Webex doesn't care about the customer. "conference call and slideshow use"
"webex vs. skype vs. GTM review"
"Hard to use and share"
"Spotty connection at best "
It's nice being able to have a consistent meeting time and date. Constant connection issues, constantly changing access codes and poor call clarity. My company recently stopped using WebEx due to the connectivity and call quality issues. Maintaining contact for a district with 25+ stores. Possibility to connect multiple teams in the same call. Troubles with setting up multiple connections. Try Skype for business instead. Collaborative projects require cross-teams communication. Webex Meetings are set up to do just that. It connected me to colleagues for meetings and trainings. Was not useful. There are many other web conferencing options that work better. Not sure what WebEx offers. It took a long time to download and implement. Training. There aren't many benefits. Today webex is no competetive. with fixed price per event. Almost everything. Connectivity issues, sharing information problems. Conferences, trainings... Spent most of the time devoted to training troubleshooting with tech support instead. "Not as user friendly as goto meeting "
It takes up to much of my computer resources and it complicated to use compared to GotoMeeting or Join.Me. "Cumbersome and not as easy to use as other tools." Pretty solid screen sharing, collaboration, and meeting tool. It's a great tool to see your clients or colleagues screen in real time. All of your meeting information, and dial in info is available right away which is nice. Sharing is inferior to GotoMeeting or other competitors. Screen refreshes are sometimes slow. Sometimes I have difficultly launching the application on my computer. Consider other solutions such as GotoMeeting. "The worst webcast software on the market." Not many things that I like, but from time to time it works properly. Setup is complicated, sessions crash and webinars dont work properly. Overall, this is an incredibly unreliable tool. * We monitor all Cisco Webex Meetings reviews to prevent fraudulent reviews and keep review quality high. We do not post reviews by company employees or direct competitors. Validated reviews require the user to submit a screenshot of the product containing their user ID, in order to verify a user is an actual user of the product. Hi there! Are you looking to implement a solution like Cisco Webex Meetings?